Heard of Skateboarding? 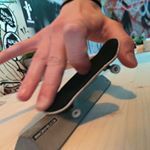 Well fingerboarding is an international sport, and I never even knew it existed! It is actually very cool to see what these kids can do.